“My yoga practice is the time each week that I take to reconnect with my mind and body. No matter what else may be happening in my life, this is the time that I put myself first. I find the practice of yoga refreshing and rejuvenating. In addition to the obvious physical benefits of improved flexibility and balance, yoga helps me think more clearly and put life’s issues into perspective. I have enjoyed Jenn’s teachings for three years and look forward to the new challenges that each class presents.” ~ Amy E.
it. Yoga is truly a way of life!” ~ Wendy S.
“Jenn is a compassionate, genuine, and caring person; someone with whom you immediately feel at home. Her classes can be described as meditation in motion. Through staying with the breath and moving into the physical postures, she teaches you the root of what yoga is about: quieting the mind. Her classes are welcoming and non-competitive. The end result is that you walk out of her class feeling relaxed and at peace. Practicing now for a few years, I can look back and see the results of applying yoga philosophy to my daily life. By staying in the present moment I am able to simplify my life, blocking out extraneous noise and worries and approaching daily tasks with mindfulness, more mental focus and clarity. Don’t get me wrong, I still lapse back into old habits at times. But before I’m too far down the terribly stressed path, I can stop, breathe, and realign my thinking in a helpful rather than harmful way. I find I am a more patient person and believe I am a better wife and mother because I have given to myself. In taking the time for myself and in quieting my mind I have more to give back to my family and others in my life.” ~ Laura G.
“Ever since I started Jenn’s yoga class two years ago, I have experienced more peace than in any other time of my life. Through the various postures, I have learned how to remain grounded yet uplifted, centered but open, and present without judgment (although I am still a work in progress). I have rediscovered my breath which has nourished me and enabled me to release my tensions and become more tolerant of uncomfortable situations. Yoga has created not only a more supple body in me, but also a more flexible mind and open heart. It has presented me with a priceless gift; the opportunity to leave behind the scattered thoughts and chaos of my mind in order to dive into the vast ocean of my heart where I can feel connected with the Oneness of the universe. This peace and connectedness inspires me to live with intention, to treat others with more kindness, and to be more patient and loving towards myself. I have learned that yoga extends far beyond my yoga mat; every day presents numerous opportunities for me to practice living in the present! It’s not always easy but I am constantly reminded that yoga, like life, is really about the journey and not the final destination. I feel very fortunate to have Jenn as my yoga instructor. She has become a true mentor and friend. Always with a kind word and a calming presence, Jenn conveys yoga in a manner that is easy to understand and just feels right. At the end of every session with her, I am left feeling serene, energized, free and taller (and that’s a lot coming from someone who is only five foot tall)! 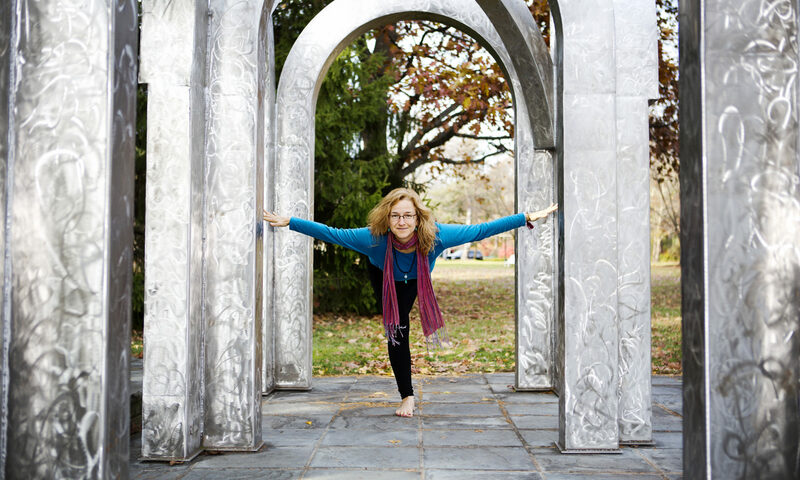 I recommend yoga highly for everyone; it’s not just for people who are flexible!” ~ Sunita B. “Yoga has been a very positive force in my life. I spend all day at a computer, and yoga has been great at relaxing my neck and shoulders. It’s also helped me learn to relax mentally and better deal with day-to-day stress. I would highly recommend it for anyone looking for a way to unwind.” ~ Todd H.
“My delightfully playful and energetic five-year-old son was being particularly playful and especially energetic one morning but for some reason, I wasn’t delighted. It took every ounce of patience I could muster to redirect his energy into getting ready for school. As I buckled him into his car seat, I remarked that he would have a much more successful day at school if he could figure out a way to calm down. Much to my surprise, he cheerfully replied, “It’s ok, Mom, I know what to do.” He then crossed his legs, rested his hands on his knees, closed his eyes, and quietly chanted, “Om….shanti……shanti…..shanti…. (all is peace).” He then opened his eyes and was a calm, peaceful, and completely delightful boy. I attribute this amazing transformation to Yogi Jenn’s Kids’ Yoga classes. My son J.T. and I highly recommend her teachings to everyone.” ~ Pam L.
students.” ~ Mary Ellen N.